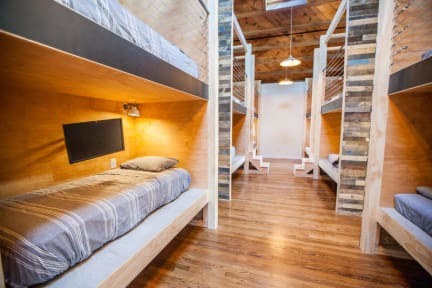 PodShare Venice Beach v Los Angeles, USA: Zarezervujte nyní! 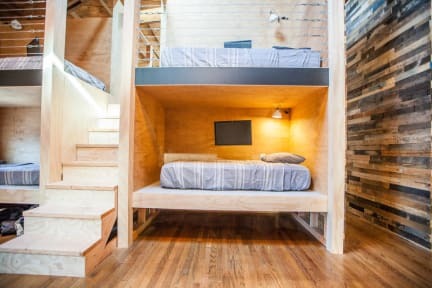 PodShare builds shared co-living spaces across Los Angeles. By booking a pod in one location, you gain access to our entire network of locations. Visit any of the 4 other locations from 10am to 10pm to access shared common amenities which include lockers, toilets, showers, kitchen, charging stations, bicycles, wifi, co-working tables, etc. PodShare Venice is located a short walk from Venice beach and its world famous boardwalk, you will be able to enjoy the sun, surf and sand. Explore the bohemian shops and stalls along the boardwalk, visit Muscle Beach for a work out or take a bike for a ride up to Santa Monica; you will love SoCal beach vibe and our huge backyard! In the other direction of PodShare Venice, you can walk to Abbot Kinney Blvd which is a hip, lively street filled with boutique stores, delicious restaurants and bars. Take a look at the map of our favorite eateries that will be on your bed, along with a clean towel. Each custom built pod has its own flat screen television with Roku (Netflix, Hulu, Pandora), reading light, and space under the pod for luggage storage. We designed these pods in a way that you can take a stairway up (instead of a ladder) and you never feel any rickety top or bottom beds. STRICT Cancellation policy: 7 days before arrival. Once your reservation has begun, we cannot refund any amount of the reservation. Check out of your bed before 11am but you are welcome to leave your bags under the pod (nothing inside of it please) and stay up to 10pm. Simple breakfast in the cubbies - continental style cereal / bread / coffee and tea. Reception is 7am to 2am everyday. Mixed dorm so both sexes are welcome.